Antique shutters bring much needed color and texture to the dining room. Three years ago, Jane posted a tour of my Alabama Stone Cottage. Several rooms have been tweaked since then. I’ve added accessories from antiquing and traveling, moved upholstered pieces and shifted some artwork I’ve always had a thing for painted pieces, and when the paint is chipped, I like it even better. So I snapped up a pair of vintage painted shutters since their greenish-gray color was similar to our French Gray Island Kitchen knowing they would be perfect in the dining room. Here’s the new look for the dining room [top]. 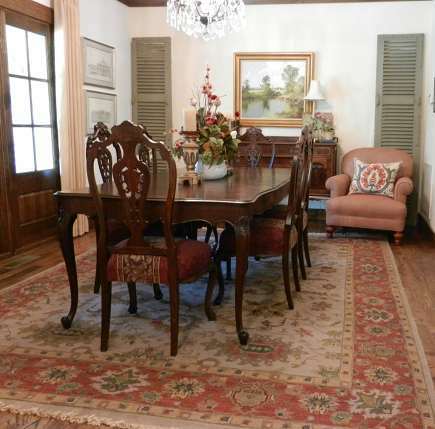 The “before” photo of the dining room is below. The shutters also help bring out the green in the Soumak rug. 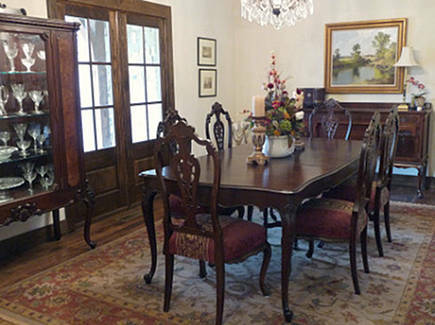 The dining room has French doors, which are found throughout the house. I framed these with Belgian linen curtain panels. While curtains were not needed to block the sun, they added color and texture and helped soften the antique walnut furniture. The upholstered chair in the corner used to be in the great room. But, after purchasing a pair of French Os de Mouton Chairs, no matter how I arranged the two sets of chairs it felt too hotel-like for me. So I moved one of the upholstered chairs into the dining room as a temporary solution. But I liked the casualness it offered and, when needed, it’s easily pulled back into the great room for extra seating. I also have gone back and forth on whether or not to reupholster the dining room chairs. The pattern and colors go well with the rug but feel a tad old fashioned. I’ve finally decided to leave as is since Mr Shops keeps talking about building another house. And while I love the walnut pieces, I will most likely do a trade in for a less formal table. But the painted shutters will be moving with us. For more shutter ideas, see Repurposing Vintage Wooden Shutters. Your DR is beautiful! I don’t think I have ever seen chairs exactly like that but I love them. You are so right, the shutters add great color and texture to the room…your dining room is so beautiful! The shutters make a huge statement in your dinning room! I love the color and your furniture. Hope you have a great week.